Perfect for an evening meal with the family! Place chicken fillets between two sheets of cling film and flatten gently with a rolling pin. Combine the scallions, tomatoes, Cooleeney, ham and potato. Place each chicken fillet on a separate sheet of cling film and spoon a quarter of the mixture into the centre of each fillet. Roll each fillet up and then seal with cling film tightly, then wrap in tin foil. Cook in the oven for 20 minutes. Meanwhile, make the mustard sauce. Sauté the shallots in a knob of butter and when softened but not coloured, add the wine and reduce by half. Add the stock and mustard. Reduce by half again. Add the cream and cook until slightly thickened. 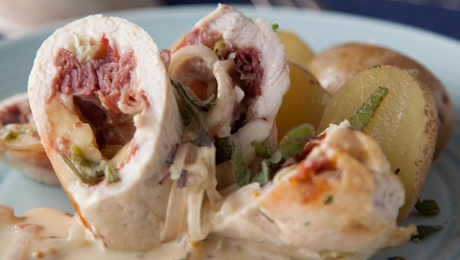 To serve, remove the chicken from the foil and cling film and slice into thirds. Top with the mustard sauce and serve with rice or steamed baby potatoes.